Is Distilled Water Safe to Drink for Survival? If you are dehydrated, clean water is clean water, but a common question I have seen popping up is concerning distilled water in a long-term survival situation, specifically consuming a lot of it over time or as a primary water source. Distillation of water is a technology that has been around for ages, and largely perfected since about World War II, and is highly useful as a reliable way to render salt water and other contaminated water sources into highly pure, clean drinkable water. But as science helps so too does it scare: there are concerns that the lack of minerals and other trace elements in distilled water, especially the super-pure distilled water made possible by today’s distilling tech, is actually harmful to your health, doing everything from depriving your body of needed minerals to dangerously diluting your electrolyte and enzyme balances over time! Yikes. 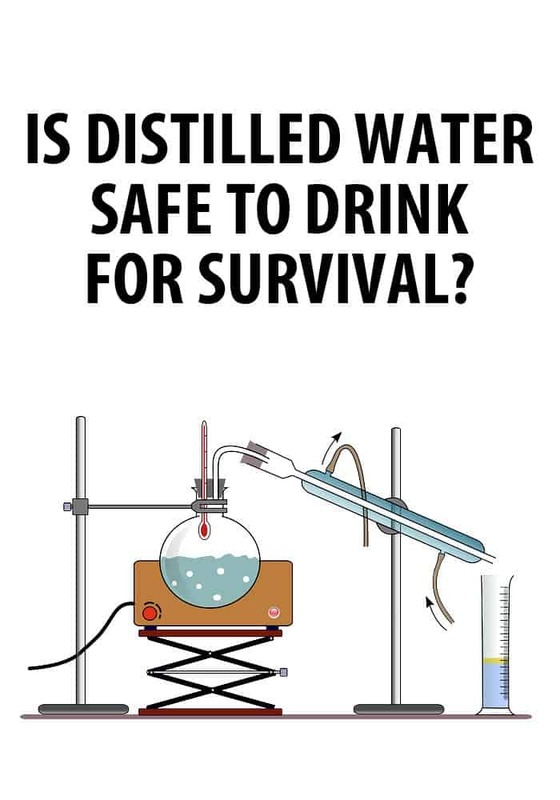 So in an effort to get to the bottom of this puzzling and unusual question for the good of prepperdom, and to pass judgment on the suitability of at-home water distillation setups, I took a deep dive into the what and how of distilled water and its suitability for drinking. For those of you who did not pay attention in middle school science classes or just never cared to know, distilled water is water that has simply been boiled to a vapor state, and then condensed into liquid in a separate container. The idea is that any materials in the water, impurities, that are non-volatile or have a boiling temperature above water will remain behind in the first vessel. Distillation is an old and highly reliable form of purification. Water distillation equipment is simple in theory: water is boiled in one vessel until it turns to steam, which then travels along a pipe or coil to another vessel where it condenses and turns into liquid once more. More advanced variations on this equipment may flash-boil water to save fuel or increase speed, and some really advanced tech employs condensate collection in vacuum. Reverse osmosis systems, commonly abbreviated as ‘RO’, are employed increasingly for commercial and municipal settings. These systems produce astoundingly pure water and do so quickly. At home or field-expedient distillers may take the form of classic stills, or be more akin to laboratory grade setups with glass piping and bottles with a water supply heated by burner or element, but water can be distilled with something as simple as a sheet of plastic over a container of water that is heated by the sun’s rays. While they vary in size, speed and amount of fuel used, all water distillation works on the same principals. Distillation of water for drinking has many advantages: it produces extraordinarily clear and clean potable water free from diseases, minerals, biological particulate and many chemicals. This is one surefire way (in most cases) to treat a water source of unknown or known-bad quality and produce clean water. Water distillation requires little in the way of oversight in a small scale, essentially being set and forget so long as your heat source is capable of boiling water. 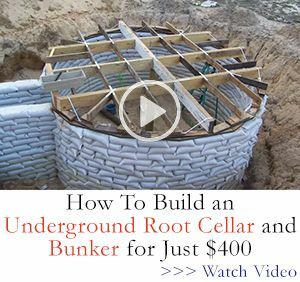 This allows you to free up time for task-stacking or rest, knowing that so long as the “boiler” is hot, you will be producing clean water at a steady rate. Distilled water is often used for laboratory and industrial purposes for any task or process where purity is a must. Water otherwise carries with it all kinds of impurities, like minerals, many chemicals and biological matter. These impurities may cause chemical reactions when water is used as a solvent or in other processes, and so distillation is a reliable, comparatively cheap way to get high purity water. Distillation has also been used, historically and today, to provide clean drinking water from all kinds of sources. Seawater is one source that is commonly distilled to remove salt and all the other impurities, and has been used on ships and by militaries for drinking water when they have fixed or mobile distillation plants or stills available. Distilled water is highly useful for creating solutions and in solvent applications where impurity could compromise the intended effect of the mix, and is furthermore certainly safe to drink, at least over a short period of time. We know that, the question we need answered is how safe is it overall, and especially over a longer time? If all we have access to for safe drinking water is distilled water for an indeterminate time, will that star to cause us health problems? Is there anything we can do to offset the mineral loss in the water? Disclaimer: the author is not a doctor. 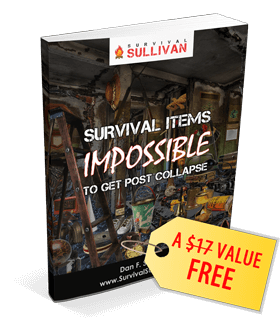 Neither the author nor www.survivalsullivan.com shall be held liable for any damage or side-effects as a result of using the advice in this article. Distillation may not remove absolutely everything present in water, like things that have a boiling point equal to or lower than the water itself, but you can sure depend on it removing minerals. While touted by some naturalists and space-cadet healthfood types as the only kind of water you should be drinking on this ruined earth, some major agencies have other thoughts, namely a little group called the World Health Organization, who extensively investigated the effects of demineralized water way back in 1982. Their research and experimentation with distilled water showed some interesting results: for starters, it will make you pee more. While not the worst thing in the world, urination as a function is closely linked to kidney performance, and anything that prompts your body to more readily discharge moisture and other “supplies” should be noted. WHO also found that, somewhat concerning, distilled water eliminated electrolytes and diluted the concentrations of vital serums in the body. While the results could not be extrapolated for very long term consumption, the effects on the body when exclusively consuming distilled water for a long period of time are cause for some concern. Water is not the primary source of intake for minerals like iron, calcium and magnesium, food is. But in an interesting twist distilled water, being demineralized, has been found to strip up to 60% of those minerals from food when it has been used to cook with! That is a serious and significant loss of minerals from food, which are the most important source of mineral uptake for the body. Long term use of distilled water for cooking could definitely have deleterious effects on your vital mineral levels in the body. It is easy to assume that your crisis will not last so long that this mineral depletion will be an issue, but that would be a mistake: your body is consuming minerals constantly, and you lose a significant amount of them through sweating. 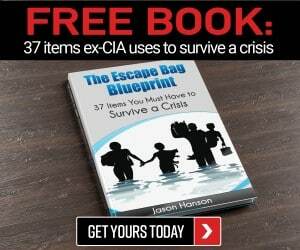 So when you are busting your hump to survive, by building, running, fighting, digging, rucking or whatever, your body will be shedding salt, potassium and other minerals by the bucket full. Rehydrating with distilled water will not replace those minerals. Not good. Lest you take this as some admonishment to take a vitamin and call it good, you should know that correct mineral levels and replenishment is vital to good health, with many of the most common minerals found in water and food (and subsequently stripped by distilled water) are vital for cellular membrane health, electrolyte balance, metabolic function, hormone function and even oxygen use. Deficiency in any essential nutrient will sap your strength, hurt your health and, most seriously, weaken your immune system drastically. In short, if at all possible try to avoid the long term use of distilled water as your primary source for drinking and cooking if you have other options. The resulting loss of minerals in your body over time may cause health issues or exacerbate existing ones. Natural mineral concentrations in water are important for the health of all organic life in their native environments. While this is not to say that missing minerals cannot be had through food or supplemental means, it does affect how your body can make use of the water it ingests. Something to keep in mind if you plan to go 100% distilled water as part of your SHTF plan. Bottom line: Distilled water is safe to drink and a vital source of water in the short to intermediate term, but its effects on humans when consumed exclusively for long term use are still not 100% understood. It does show a few troubling effects that you should be aware of, especially when used for cooking. Don’t get fussy and throw the baby out with the distilled bath water; learn what distilled water can do for you, and make use of it. But be cautious if you plan on drinking it or cooking with it for a long time. The following are a few options for at-home production of distilled water. These solutions all require various amounts of time and setup, but might be worth it for those of you who want to be able to make your own instead of hauling home gallon jugs from the grocery store. This is the Cadillac of at-home countertop distillation. This unit is U.S. manufactured and promises that at no time does the water produced come into contact with plastic. It is heavy, and dang pricey at about $600 bucks, but its quality is second to none and it is scarcely bigger than a coffee maker. A cheaper model and one of the most popular, H20 Labs offering is convenient and produces a gallon of distilled water in about 5 hours. Beware, as some users report issues with a metallic taste, and H20 labs offers activated charcoal filters to “further improve” taste, lending these complaints credence. Nevertheless, a well known and well liked product all the same. Waterwise’s newest model and the replacement to their popular long runner the 8800, this is the at-home distiller for those who want convenience. The 3200 is among the fastest in its class, cranking out a gallon of distilled water in about 4 hours, a significant time saving over competitors. Complete with a pause and pour option just like your coffee maker, this is among the easiest models to use. You can find even more suggestions for a water distiller here. Distilled water is absolutely safe to drink and a highly reliable option for producing potable drinking water from suspect sources in short or medium term situations. However, it may present some health issues if consumed exclusively for a long time. The minerals that naturally occur in most drinking water sources, even ones filtered or cleaned by other methods, are valuable to your health and important for usual bodily processes. Make sure you take that in to account before counting on distilled water long term. Hi, im a raw vegan with 7+ years, 7 years ago i started drinking distilled water which i make myself till now, ive been warned by doctors that i wil face health problems, ive been studying health and diet related topic for 3 years, read over 30+ books.. Here what i say out of my experience: in the last 7 years i only seen a dentist doctor and 2 times a family doctor and that just because i had to get a full medical exam for my martial arts trainings. You guys need to understand one simple thing, the minerals and vitamins in water are not organic and your body cant use it so it will start putting these minerals away in your joints and in liver, also they will settle on your veins and harden it, you need an ORGANIC source of minerals that your body can use in the system, thats why when people get older they accumulate enough of the minerals that they start to get arthritis, kibdney and liver stones, hard veins. There is a good book written by an american doctor “Paul Bragg” and the book is called “Water-The shocking truth” i would strongly recommend you to read it along the other book which is called “The miracle of fasting”, specially in survival you need to understand how fasting works and use it in favour and not against you! Edward is 1000% correct and on point. I spent years aboard submarines. Distilled water tastes best and having used it for coffee and daily drinking, pure H2O is a requirement. The poison people buy in bottles and most tap and well water is a likely cause for what ails you. You will also want to cut out sugar, all kinds, and remove anything in a box or plastic bottle. Live out of the produce aisle for a month. You can always go back to that can of poison you love so much. Also agree with comments; the beauty of distilled water is what you are NOT getting, i.e., you are not getting dangerous fluoride that makes bones brittle and weakens neural function, you are not getting disinfection byproducts like trihalomethanes, no lead, no vinyl chloride, no micro platics, no pharmaceuticals, and no volatile organic compounds. Distilled water passes every safe drinking water test. Get your nutients in food, and be sure to drink the broth of boiled foods. For improved taste, add a little himalayan salt. Also agree with comments; the beauty of distilled water is what you are NOT getting, i.e., you are not getting dangerous fluoride that makes bones brittle and weakens neural function, you are not getting carcinogenic disinfection byproducts like trihalomethanes, no lead, no vinyl chloride, no micro plastics, no pharmaceuticals, and no volatile organic compounds. Distilled water passes every safe drinking water taste. Get your nutrients in food, and be sure to drink the broth of boiled foods. For improved taste, add a little himalayan (or sea) salt. I personally use, and LOVE my Berkey. I bought it after I received a letter from our water dept (or whatever they are called) about a recent test they ran on my tap water. The lead concentration was high, but “not high enough” to cause concern. WTF? If there’s no reason for concern, why did they send the letter in the first place and point out the lead was “high but safe”??? I moved to TX from IL 4 years ago and brought my 2 cats with me. 2 years after moving here, BOTH developed tumors and had to be put down. They were both less than 9 years old! I am convinced the tap water killed them. I bought my Berkey filter shortly after and it works brilliantly! EVERYTHING tastes better now. I would highly recommend them as they are gravity fed and there are no moving parts. They last up to 6,000/gallons. The filters are pretty cheap too- I think they are going for like $120? I got the Berkey Light- not the SS one. Best investment I made. Bottom line- filter your water, especially tap water. I would rather “miss out” and trace amounts of minerals than consume heavy metals, pharmaceuticals, etc. I agree that this article is sadly mistaken.